The Parthenon Company Blog - Specialists in Wound and Ostomy Supplies: Eakin Cohesive Seals at a Super Price!!! Eakin Cohesive Seals at a Super Price!!! Something positive for all of you who are discouraged with talks of a looming $23 trillion national debt! Even though this won't save our economy, perhaps it will make you feel better knowing that the Parthenon Company is making every effort to save you money!!! NOW...for a limited time, you can buy ConvaTec's Eakin Cohesive Seals for $95.50! That's a savings of around $10 compared to any other retailer out there!!! Somewhat of a specialty item and definitely a pricey ostomy accessory, but for those of you who like the Eakin Seals this is a great buy! The 839002 can be used for colostomies, ileostomies and urostomies. It works by being stretched and folded to fit around the stoma to protect the nearby skin or peristomal skin. Eakin seals act as a filler to make an otherwise uneven surface smooth so that an ostomy appliance can be properly fitted to the body. ConvaTec has a helpful website offering further information. You may even be able to get a free sample from ConvaTec by calling their customer service line at 1-800-422-8811. If you don't purchase online and wish to call us to order, please mention that you would like our online price and we will honor it on this special! 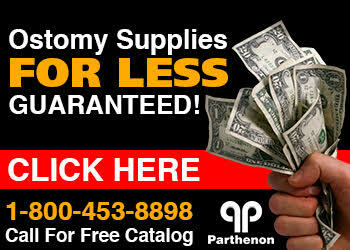 Call Parthenon at 1-800-453-8898 and request our 2009 (100 pages) catalog, the largest ostomy product catalog in the country! The Parthenon is a specialty medical supply store focused on servicing people with a colostomy, ileostomy, and urostomy surgery. We sell all brands including, Hollister, ConvaTec, Coloplast, and NuHope. We guarantee the lowest price and superior customer service. Next time you order supplies, give us a call and see how much you can save!! !